Once a week I post interviews with interesting designers about their insights on their experience of working in the Knitting industry. I’ve noticed that every designer makes their living in a slightly different manner bringing their own unique presence to the Knitting world. 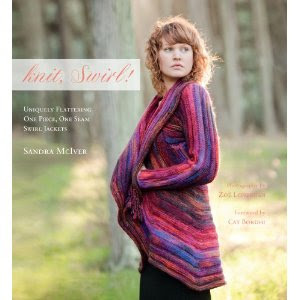 Sandra is the author of knit, Swirl! You can find Sandra's website here. I find that inspiration comes from everywhere and anywhere, and often from the least likely places. I still laugh to myself when I think that the circular Swirl form was inspired by a rectangle—that wonderful large, long garter stitch rectangle that makes up the bottom portion of Sally Melville’s “Einstein Coat.” I found myself entranced by the sculptural quality of that length of fabric as I bent and twisted and manipulated it into different shapes. That experience had a huge impact on me as a designer. From that point on, I wanted to create clean, sculptural designs defined primarily by their contours, with seams artfully placed to support, not interrupt, the interconnected energy of the knitted form. Learning new techniques was the driving force in my knitting for many years. During that time my favorite technique was usually the one I’d just mastered. As my interest in sculptural form grew, I found myself going back to simple knit and purl stitch combination's because they provided the strong structure, simple shaping and clean lines that I was after. While knitting for my book, I did develop my own technique for a “No Twist Join” that has proved to be extremely helpful in ensuring that the lengthy first rows of a Swirl can be reliably joined into a circle without that dreaded twist. Given the amount of anguish that discovery has saved me, I’d have to say that’s currently my favorite technique. It is difficult to talk about size in a Swirl without talking about style in the same breath. Swirls, by virtue of their circular shape, bias drape, and lack of size-defining seams, are highly adaptable; all sizes are suitable for a range of body types and dimensions. The same size can be a fitted jacket on one person and a flowing cape-like coat on another. As long as appropriate sleeve length adjustments are made, a knitter’s choice of size should be as much about style as it is about how big or small it needs to be to accommodate a given body. I offer three sizes (one, two and three) in order to offer a range of fit and styling choices. Size Two could be considered a “one-size-fits-all” version, with size one and size three extending the range of size and style for all. I love to look at and learn from other designers’ work! I’m thrilled by the thought that today’s designers are still inventing new techniques and creating new approaches using a centuries old art form. There are times, however, when I think it is appropriate not to study another designer’s work. 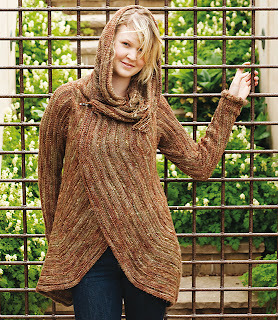 When I was working on knit, Swirl!, Hanne Falkenberg, whose designs I greatly admire, released a new pattern for a circular sweater. I studiously avoided acquiring any knowledge of that pattern until after my book was done….and was much relieved to find that our approach differed substantially. One day, though, I’d love to knit her version. I’m happy to say I’m ignorant of the controversy. Swirls are simple to knit, not in deference to the knitter, but because that approach results in the clean, sculptural form I was after. I want my patterns to be attainable for relative beginners, but still interesting for seasoned veterans. In my book, I explain in detail the techniques that I feel are very important to use. On the other hand, where a pattern direction can be satisfied by a variety of techniques, I leave the choice to personal preference. I recognize that in doing so I may leave the less experienced knitter needing to do a little research, but researching the various ways to accomplish basic knitting tasks is the best way to learn. I still find myself going back to my favorite how-to books on a regular basis and never cease to come away with a new insight. I design as I knit, so its important for me to do most of the knitting myself. 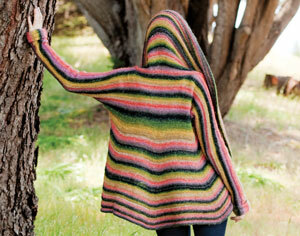 I knit all but one of the garments you see in the book, and several that didn’t make it in as well. Recently I began working with four excellent knitters who have helped me to create additional Swirls in a range of sizes. One just set a new record, knitting a Swirl in a week! Those garments make up four traveling Swirl trunk shows that have begun to make the rounds at local yarn shops and knitting venues. The first years of working on the book were all about learning and designing. The last two years required a plan to get the project to the finish line and deliver a book that would make my investment in writing and self-publishing worthwhile. It was at that time that I finalized the book concept and developed a time line, marketing plan and budget. I do—several of them in fact. Cat Bordhi is my mentor-in-chief (I prefer the title Fairy Godmother). She is ably assisted by the “Visionaries”, a group of self-publishing designers who annually attend Cat’s “Visionary Retreat” to review our collective books-in-progress, give input and suggestions, and help each other deal with issues we each face along the way. The mentoring of one another continues throughout the year via chat group. Knit, Swirl! is just one of several truly excellent books by our Visionary Authors. For a list of our authors and their websites go to www.visionaryauthors.org. The business model I follow is the one I learned from my father and used for 25 years on a much larger scale as co-founder and president of a small ultra-premium winery. It boils down to this: produce quality. The impact has been huge. 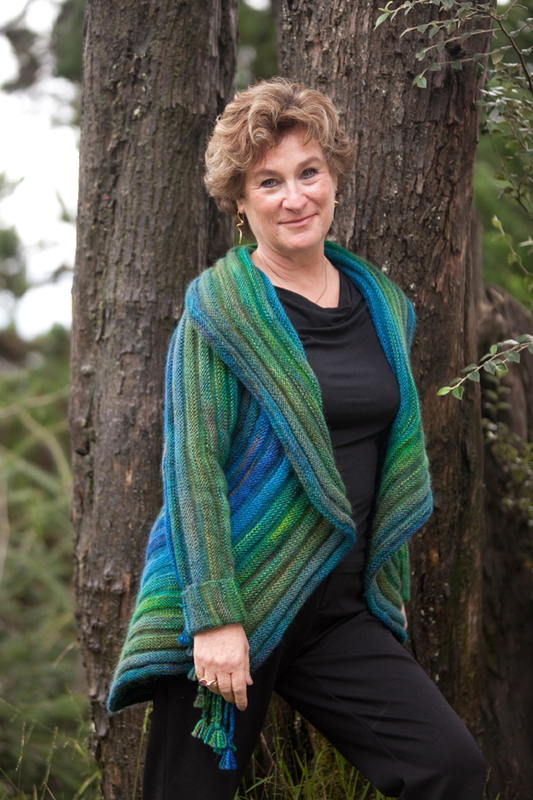 Knitting blogs and online newsletters have provided the lion’s share of the coverage my book has received. I keep in touch with Swirl knitters around the world via my website, www.knitswirl.com, emails and the “knit swirl” group on Ravelry.com. In terms of sales, half of my US sales are made by my distributor Unicorn Books & Crafts (a company with a significant Internet presence) to local yarn shops, many with robust online shopping components. The other half I sell myself through Amazon’s Advantage program, a program that is a boon to small entrepreneurial efforts like mine. Absolutely! Tech editors are essential. My tech editor, in addition to doing all the usual spotting of errors, inconsistencies, and omissions, took my cumbersome design calculations and created elegant spreadsheet formula pages that were able to do the work faster and with greater accuracy than I. Beyond that she was a great sounding board at all times and the only person with whom I could speak “Swirl” through the years that it took to write the book. I work at home and am blessed to have the undying support of my husband, children and grandchildren. I am able to deal with the priorities of both life and work on an as-needed basis. My days are all long and frequently hectic, but I enjoy almost all of what I do. Hey, I get to knit and call it work! How bad can that be? Happily, the growth curve that took me from avid knitter to self-published hand knit designer, has taught me to truly appreciate and welcome constructive criticism. The other types of criticism, especially the overheated Internet communique type, I’ve learned can best be handled by being as nice and as helpful as possible in my response. I almost always get an immediate note of thanks along with an apology. The criticism that I admit still gets to me is the type that comes in the form of just-plain-mean public review postings from folks who have clearly made snap judgments after a cursory look at my book. Slowly, I’m even learning to live with those. I am pleased to be able to say that after seven months in the market, sales of my book have covered my writing and self-publishing costs (photography, book design, tech editing, printing, shipping and marketing) and returned a profit sufficient for me to feel I’ve been reasonably well compensated for my investment of time and energy. A third printing appears to be imminent, so that picture will continue to improve. I’d say first explore the industry fully to identify all the avenues out there for a career in knitting. The list is much longer and more varied than you might initially think. In your search you may even discover an unmet need or an unfulfilled consumer interest that you are uniquely able to address. Are you entrepreneurial at heart or are you happier working for someone else? The answer to that question is important in charting your course. Take it slow. Be persistent. Identify at least one opportunity a day, and act on at least one a week. And lastly, believe in your potential for success.